We Install and Improve Units Fast! We know how exciting it can be to finally finish off that basement. You’ve just made your home into a brand new house and refreshed your living space brilliantly. You’ve most likely enjoyed the subdued light in the mornings while the summer was whiled away and you’ve found the late summer movie night to be of particular fun. But now, winter is upon us and they’re famously unpleasant in Centennial, especially if you’re not enjoying the powder on the slopes. While hot chocolates and warm holidays with family are a special occasion that only happens in the winter, it’s also followed by cold weather and drizzling snow and rain. If you’re not prepared for that chill, your finished basement is suddenly going to feel much less accommodating. At Valiant Air, we know it’s not impossible to find a heating solution for your newly finished basement. And we have a whole host of solutions to this conundrum that we can present to you so that you can decide what’s best for your home. We like to think of baseboard heating as a combination solution to your cold weather issues. The bare bones of the system are that it is a hydronic electric baseboard heater that can be hardwired into the home electrical system. They provide excellent spot heating when you are in need of it and each room in your basement can have its own spot heating. The main downside of this heating system is that they’re rather energy-inefficient which means a larger carbon footprint in tandem with a higher energy bill to keep these running. This is especially since they are not really the most elegant solution for heating your downstairs space. While the heaters don’t need to run along your entire baseboard, they still manage to take up a lot of space and will limit what you can do with the room itself. Much like extending your ductwork, which we explained in our previous blog, you’ll need a professional to help you calculate the downstairs heating needs. When trying to calculate if this is a viable option before you call in the experts at Valiant Air, calculate that you’ll need at least one baseboard heater per room, but you’ll likely need more than that. Even though they seem simple to install, you’ll need to get special electrical outlets and wiring setup for them before you commit to baseboard heating. Most baseboard heating systems require a 20 amp, 240 v circuit to power them. They’ll all need to be hardwired into your supply circuits and that may take quite a bit of maneuvering on your electrician’s part. That being said, some baseboard heaters are essentially space heaters and can be moved and plugged in elsewhere at will. They’ll take up much more space than the average space heater though and is not a convenient or value-adding sort of heater. If you added a finished basement both for the attraction as well as adding value to your home, you’ll want to avoid this band-aid solution. If you’re thinking of getting something ineffectual, look to a wood pellet stove. Granted, it’s neither electric or gas, but it’s not exactly efficient either, just because some might consider it more energy efficient. You’ll need to somehow vent this stove to the exterior of your home. It also exudes a rustic style that is compatible with little else other than a cabin or woodsy feeling in a room. 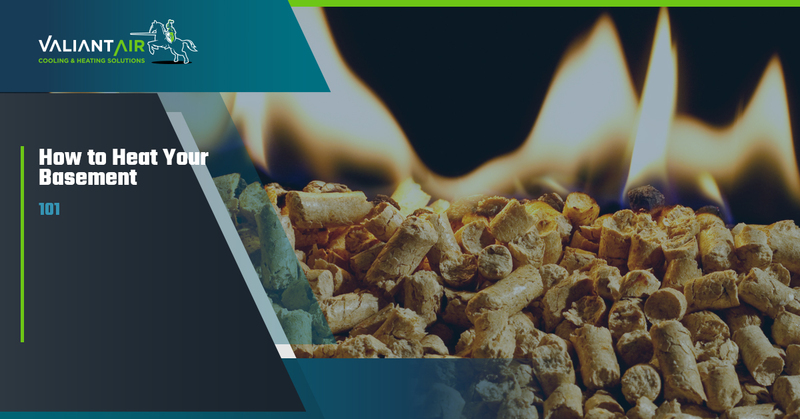 Wood pellets can start to add up if you’re buying them once a week with all of your groceries and using them to heat one of your main living areas. It’s not the best choice for anyone who doesn’t want to feel like they’re living in a log cabin in Centennial. They’re an option, but not a permanent solution. In fact, we’d recommend installing a more versatile form of heating your basement and then combining the efforts of several different heating systems if you’re married to the idea of using a space heater. They do have a couple upsides in that they’re very inexpensive to purchase and run as well as the flexibility of where they’re situated. We’d even go so far as to recommend them for outside use though, we’d caution anyone else against this. Just because they worked in your cold apartment or dorm room does not mean they’ll work in your new basement. There’s no reason you shouldn’t invest in your comfort and heating. You built out this newly finished basement, you want to spend time down there during the winter, curled up reading a book or playing with your pets. Don’t make the space heater a part of those new fond memories you’re making, make your basement’s heat controlled. Installing fresh ductwork with the help of Valiant Air is worth the investment because you’re investing in how much you’ll be able to enjoy the basement as time goes on. You’re also affecting how much your house will be valued at and increasing the value for new home buyers when you’re finally ready to sell and move on. Don’t wait until it’s too cold to go down and enjoy your basement. Invest in the expanded heating system now with the premier heating replacement and repair company in Centennial. Reach out to us today to schedule your appointment.